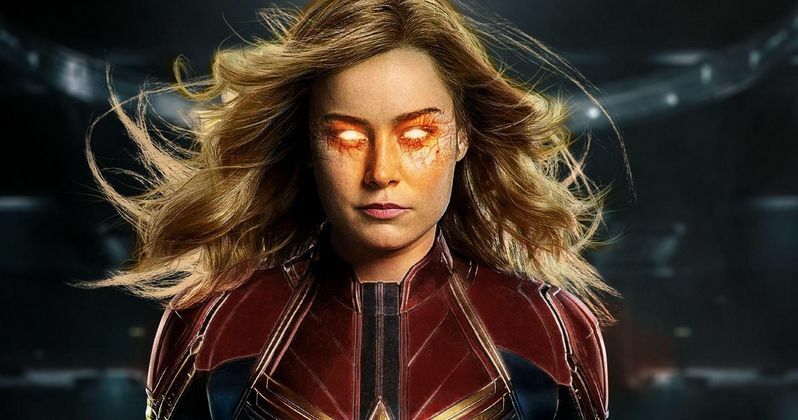 Captain Marvel is based off of Kelly Sue DeConnick's take on Carol Danvers, says Marvel Studios boss Kevin Feige. Marvel Cinematic Universe fans were treated to the trailer last month, and as is the case with most trailers, there were a lot more questions than answers. However, the hype for the first Carol Danvers standalone movie is off of the charts as fans try and figure out how she'll fit into the MCU and later in Avengers 4. Feige previously declared that Danvers is the most powerful character in the MCU, which has only added to the hype. Kelly Sue DeConnick revamped the Captain Marvel comics in 2016, taking the character in a very popular direction. Additionally, she took the look of Ms. Marvel and ditched it, giving Carol Danvers a full makeover for her set of comics, leaving the swimsuit look and going with the now iconic suit that will be seen when the movie hits theaters early next year. Kevin Feige had this to say about DeConnick's work and the history of the character. "Yes, the history of Captain Marvel goes back, and it is rather confusing. The one we're doing is based on Carol Danvers, and in particular, the Kelly Sue DeConnick one which has only been around the last few years. But it's been really inspirational for us." The suit and helmet shown off in the Captain Marvel trailer was actually the result of a high stakes bet that Kelly Sue DeConnick made with artist Jamie McKelvie in order to get a redesign for Carol Danvers in the comics. As it turns out, Marvel Comics didn't have the budget to hire McKelvie, so DeConnick decided to get crafty. In the process, she also received the awesome design that she wanted. DeConnick explains. "I called Jamie and was like, Alright, I want you to make a bet with me. I bet if you do a Carol Danvers redesign for Captain Marvel that Marvel will buy the design from you. And if I win this bet, then I get a redesign and you get paid. And if I lose this bet, I will pay for the redesign." Luckily, Kelly Sue DeConnick won her bet. Otherwise, that would've been a very expensive redesign on her hands. Anyway, Jamie McKelvie's art is what the Captain Marvel movie is based on, which is a major score for him as well. The suit was already a hit before Captain Marvel #1 hit the shelves, with tattoos and fan art flooding in after the reveal was first made. And now, Brie Larson is taking that look to the big screen. Ryan Fleck and Anna Boden directed Captain Marvel from a script written by Geneve Robertson-Dworet. Robertson-Dworet recently commented on the great lengths that Marvel Studios went to get females working on all parts of the movie, noting that they also had female producers working on the project as well. Kelly Sue DeConnick's vision of Carol Danvers is what we're going to see on the big screen next year, so we'll find out how much they lifted from her stories then. You can check out the interview with Kevin Feige below, thanks to the Atomic Buzz YouTube channel.